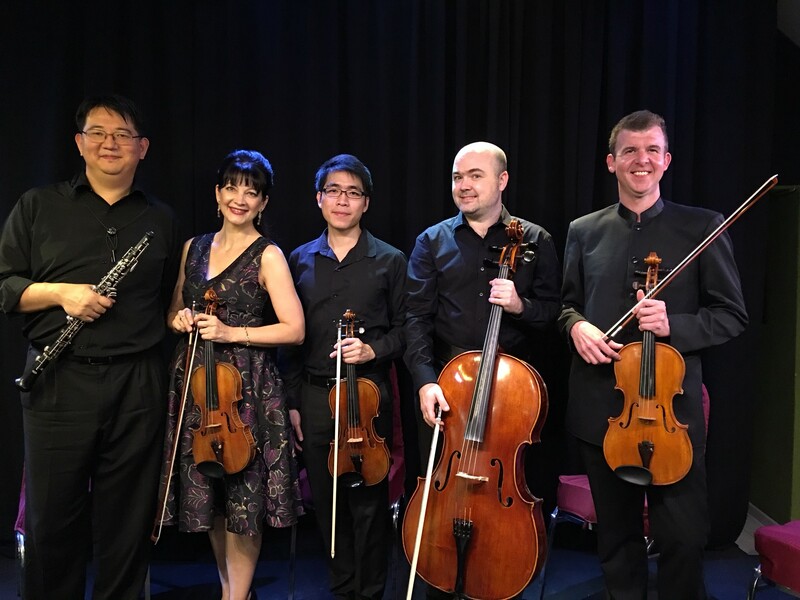 For the second time in recent months, The Salaya Ensemble – this time in the form of a quintet – made another highly successful appearance at Ben’s Theater in Jomtien. The response from the audience was warm and enthusiastic and one of the listeners described it as “a marvelous night of exceptional music-making”. The standard was remarkably high and wouldn’t have been out of place in an international concert hall. The Salaya Quintet is made up of key members of the Thailand Philharmonic Orchestra, arguably the finest orchestra in the country. They include Cooper Wright (oboe), Inga Causa and Mahakit Leardcheewanan (violins), Danny Keasler (viola) and Marcin Szawelski (cello). The start of the concert rather caught me by surprise because the first work, a Mozart oboe quintet, appeared to have a player missing and didn’t really sound much like Mozart. It slowly dawned on me that the programme order had been changed and we were actually hearing a quartet by Carl Stamitz. I suspect some other members of the audience might have been equally bewildered. Stamitz, who had a riches-to-rags life story, was one of the most influential of the Mannheim School of composers. His Quartet in D minor Op. 8 No. 1 appeared in 1773 and was written in the so-called gallant style in which simplicity and elegance were the order of the day. The finely-judged instrumental balance of the Salaya Quintet was remarkable throughout the work, the rich and sonorous string tone contrasting strikingly with Cooper Wright’s warm and focused oboe sound. There was some beautiful playing and sensitive timing in the aria-like second movement, and the bustling finale with its answering phrases and contrapuntal devices was given a sprightly and exuberant performance. Mozart’s Oboe Quintet in C minor began life as a serenade for wind instruments. In 1788 he transcribed it for strings and later made yet another arrangement for oboe and string quartet. The substantial first movement was given a confident performance with superb articulation and careful regard for dynamic contrast. The lyrical Andante was delightful with its sumptuous harmonies, made even more so by the accomplished playing and the expressive “placing” of the notes. The sensitivity and quality of the performance reminded me of the enormous chasm that lies between a good amateur musician and a professional one. It also reminded me of Debussy’s thought-provoking remark that “music is the space between the notes”. The last item on the programme was the three-movement Quintet for Oboe and Strings by the English composer Sir Arthur Bliss. It’s a bittersweet work which moves from a pastoral setting at the start to more lively and dance-like music shifting through shades of colour and mood, sometimes playful, sometimes wistful and sometimes dramatic. Perhaps for these reasons, apart from getting all the notes in the right place, it’s quite a challenging quintet to perform. It was clear that The Salaya Quintet had put a huge amount of work into the rehearsals. As usual, the string tone was impressive and throughout the work the blending of the individual instruments was impeccable. The sense of Englishness was noticeable in the second movement with its shades of Delius and the technically-demanding third movement brought the work firmly into the twentieth century. The musicians handled the difficulties of this movement (which contains a vivacious Irish sounding jig) with tremendous aplomb and received a well-deserved and enthusiastic ovation from the audience. The concert brought the current season of events at Ben’s Theater to a triumphant close.